Bastion is a cool and stylish action RPG taking place in a post-apocalyptic world and involving several cool features, such as a customizable central hub (the Bastion itself), which expands as the player progresses. The feature that best characterizes the game best is the narrator, dubbed the ‘dynamic narration’ system. A wise old man called Rucks, who you meet in the game, takes this role. As well as delivering story exposition, he makes comments during gameplay based on what the player is doing, even offering hints such as where the player can’t go at a certain point. I really like this feature, as it gives the game so much character, and it’s a very creative and entertaining way of giving tutorials and hints. Composer Darren Korb has an impressive amount of experience in rock music, which is the main stylistic focus for the music. 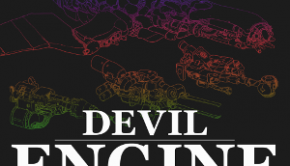 It also incorporates a lot of influences from the old west to more electronic genres of music. The rock aspect is nothing too heavy, going more along the lines of indie rock and folk, and some Indian influences thrown in for good measure. There are also some vocal songs, sung by the narrator Logan Cunningham and Darren Korb himself among others. The first track, “Get Used To It”, is just a quiet guitar riff in the background with some narration from the games narrator Logan Cunningham, which sets the mood and the scene. I like it when soundtrack albums include narration such as this. It worked well for 1982’s Conan the Barbarian and Tron: Legacy, and it works well here too. It helps that Cunningham has a really cool sounding voice too. Then we move on into “A Proper Story”, which gives the listener a feel for the style of music, and there’s some great guitar work in here. The next track, “In Case of Trouble”, is more laid back and introduces some strings and flutes into the mix, before “Bynn the Breaker” adds some percussive and electronic effects over the top of the already established texture. “The Sole Regret” breaks up the typical rhythm with an ad lib guitar solo at the beginning of the track, then when the slow beat comes in we get some Indian style musical lines as well as instruments such as the sitar being used. 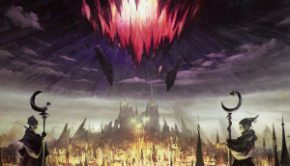 “Build That Wall (Zia’s Theme)” is the first vocal song of the game. It’s nice and laid back, and the singer Ashley Barrett has a nice voice. These songs are probably going to be the reason why most people interested will buy the soundtrack, and it’s what Darren Korb does best. “Mother, I’m Here (Zuff’s Theme)”, sung by Korb himself, is laid back too, with just guitar and vocals. Korb’s voice is a well toned American rock tenor voice. The two singers then duet for “Setting Sail, Coming Home (End Theme)”, and their voices complement each other well. This song has a bit more to it than just guitar and vocals, and works well. 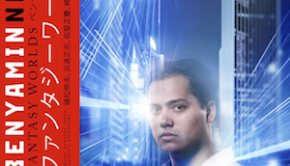 “Terminal March” starts introducing some heavier elements, such as a distorted guitar, through a chaos pad, Muse style, and heavier drum sounds. This track is one of the best examples of the great guitar work on this soundtrack. “Percy’s Escape” has a faster, more intense feel with it’s driving percussion and shimmering strings. This track and the next, “Faith of Jewel”, explore some nice dissonance too. “Mine, Windbag, Mine” sounds like it could belong in a spy film or game during a stealth section. The main problem that I found, at this point, a lot of the tracks are very repetitive, which could get tedious if listening to the whole album the whole way through. The rest of the soundtrack is mostly more of the same. “Slinger’s Song” offers up a few more progressive elements to make it a bit more interesting, while “Brusher Patrol” adds a few electric guitar solos. A few tracks, such as “The Mancer’s Dilemma”, start introducing some more traditional fantasy scoring such as harp lines and heavier string scoring. The drum beat towards the end of this tracks starts to sound almost like a dubstep drum beat. “Pale Watchers” also has some of this traditional fantasy scoring, adding a bit of much needed variety into the soundtrack. “The Bottom Feeders” meanwhile introduces some chiptune sounds and jazz drumming to mix things up a bit. This can sound a bit messy unfortunately as there are loads of different ideas going on at once but it’s interesting. Unfortunately these tracks do still suffer from too much repetition. The final track, “The Pantheon (Ain’t Gonna Catch You)” features the narrator Logan Cunningham on vocals. He isn’t the best singer out there, but his gritty voice makes up for it, especially the “Thank You” at the end, which sounds really cool. “What’s Left Undone” is 22 seconds of Logan going “dum dum”, which is a bit weird but quite cool. 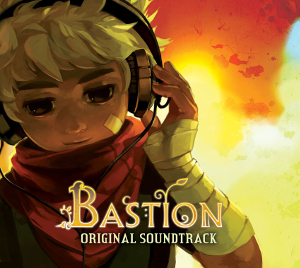 The Bastion soundtrack is a solid soundtrack with an interesting and consistent sound, with some nice vocal songs. Unfortunately, this consistency does mean that variety is slightly sacrificed; many of the tracks become quite repetitive over their 3-4 minute lengths, and the alternative ideas explored in the second half of the soundtrack could’ve been used more. This being said, there’s some great guitar and vocal work in here and all the music fits the game well. 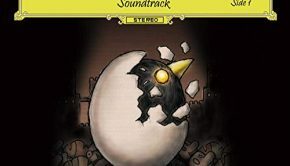 If you’re looking for more variety from a video game soundtrack, then it’s still worth checking out some of this music, particularly the vocal tracks. However, if you love guitar-focused soundtracks, then this soundtrack is right up your street.